My favourite film of the 2014 London Film Festival, director Morgan Matthews expands his 2007 BAFTA-nominated 'Beautiful Young Minds' documentary into a dramatic feature. 'X+Y' (★★★★½) stars Asa Butterfield as Nathan, a teen maths prodigy on the autistic spectrum. Aided by his amusing but physically deteriorating tutor (Rafe Spall), we follow Nathan on his quest to compete in the International Mathematical Olympiad, while struggling to connect with his single mother (Sally Hawkins). His journey also explores young love and Danny Cohen's hazy cinematography and James Graham's taut screenplay appropriately showcase Nathan's comfort in numbers and colours over human communication and emotion. There are however many emotive scenes but perhaps surprisingly one of the most effective is a scene where an obviously nervous Nathan is expected to solve a maths problem in front of his peers. The end peters out somewhat but nonetheless, 'X+Y is an endearing triumph that doesn't succumb to a cheap sentimentality that could have dominated proceedings. Director Neill Blomkamp fleshed out his 2006 short 'Alive In Joburg' in stunning fashion with the universally acclaimed sci-fi drama/social commentary 'District 9', and his latest film similarly takes on 2004 short 'Tetra Vaal'. 'Chappie' (★★) focusses on a near-future Johannesburg, where androids have successfully supplanted the city's police force. Robot designer Deon Wilson (Dev Patel) isn't satisfied with his successes and creates the world's first fully sentient robot, which inadvertently finds itself mixing with the criminal underworld. 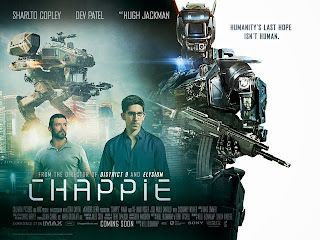 After the relative misfire that was 2013's 'Elysium', Blomkamp was looking to bounce back - unfortunately, 'Chappie' is arguably his biggest failure. While a visual feast, with seamless CGI, 'Chappie' is frustratingly messy. There are also too many echoes to the far superior 'District 9' with similar antagonists and final battles. Let's hope Blomkamp gets his mojo back for his forthcoming 'Alien' project. Originally slated to air on NBC, 'Unbreakable Kimmy Schmidt' was instead snapped up as a Netflix original, allowing binge-watchers everywhere to rejoice. Created by Tina Fey and fellow '30 Rock' writer Robert Carlock, the series follows Ellie Kemper's Kimmy Schmidt as she adjusts to life in the big city, having spent the last 15 years underground in a cult. 'Unbreakable Kimmy Schmidt' is ridiculous, overblown, and larger-than-life - which are as much positives as they are negatives. The breezy nature perhaps lacks a more emotional component that would give the series more staying power but there are plenty of witty quips with which to engage. Plus, a great theme tune from The Gregory Brothers. "Females are strong as hell". 'Community' has had a running joke about lasting for "six seasons and a movie" and with Yahoo taking on the series for the imminent sixth season, we remain to see whether the movie emerges. Slashfilm have the trailer and a clip from the new season, which debuts online tomorrow. To the delight of children across the world, 'Frozen 2' has been announced. For many adults however, the surprise announcement of 'Zoolander 2' trumped the previous news - with Ben Stiller and Owen Wilson rocking the runway at Paris Fashion Week.